Toll U.S. 80 provided a more direct route east to Tybee Island (Savannah Beach) through Downtown Savannah along Bay Street, General McIntosh Boulevard and President Street Extension. This alignment continued east along Island Expressway / Savannah Beach Expressway to a toll bridge across the Wilmington River between Causton Bluff and Oatland Island. Toll U.S. 80 and U.S. 80 converged at a wye interchange on Whitemarsh Island, with U.S. 80 navigating along a series of causeways and bridges across marsh land to Fort Pulaski National Monument and Tybee Island. 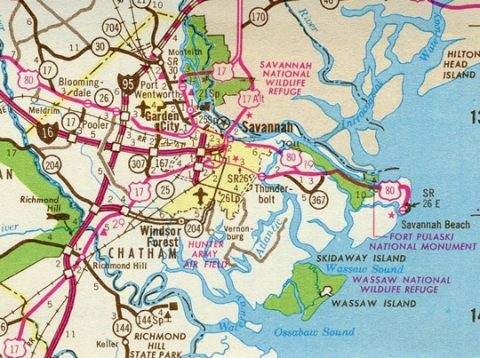 Tolls on Islands Expressway were dropped in 1980.1 The span at the time consisted of a two-lane, single leaf bascule bridge built in 1963.2 Fares were collected at booths east of the Wilmington River. Montgomery Street heads north from Franklin Square to intersect Bay Street, one block from its separation with Georgia 25 Connector. Montgomery Street was the former alignment of U.S. 17 north & 80 west on the west side of Downtown Savannah. Photo taken 05/29/05. Baynard Street intersects Bay Street one block north of Ellis Square. Photo taken 05/29/05. Whitaker Street flows south from Bay Street and the Savannah Riverfront through the central business district. Photo taken 05/29/05. Bay Street east at Bull Street across from Savannah City Hall. Photo taken 05/29/05. Bay Street east at Drayton Street south. Drayton Street bisects historic Downtown Savannah southward to Forsyth Park. Photo taken 03/15/10. A one block section of Abercorn Street links Bay Street with Bryan Street at Reynolds Square. Abercorn Street expands into an urban arterial south of 37th Street as part of Georgia 204. Photo taken 03/15/10. Lincoln Street stems south from Bay Street and Emmet Park to Oglethorpe Avenue at Colonial Park Cemetery. Photo taken 05/29/07. Bay Street east intersects the ramp leading East Broad Street south to River Street. The ramp and River Street are made of cobblestone. Photo taken 03/15/10. South from Bay Street, East Broad Street lines the east side of historic Downtown Savannah as a tree lined boulevard. Photo taken 03/15/10. Bay Street drops in elevation from East Broad Street along the north side of Old Fort Jackson. Photo taken 05/29/07. Bay Street curves southeast to become General McIntosh Boulevard at River Street. General McIntosh was closed and demolished during the President Street Project that started in January 2015. Photos taken 05/29/07. President Street overtook General McIntosh Boulevard as the main route east to Oatland Island and Tybee Island. This intersection was rebuilt during the President Street Project. The alignment of General McIntosh Boulevard was removed during early phases of the project with a replaced road slated for a later phase. Photo taken 05/29/05. President Street eastbound approaches the north end of Truman Parkway. Constructed and maintained by Chatham County, Truman Parkway is unnumbered. Photo taken 05/29/07. A small guide sign directs motorists to the left turn from President Street east to Truman Parkway south. Truman Parkway winds southward through the east side of Savannah to Georgia 204 (Abercorn Street Extension) at Southside Savannah. Photo taken 05/29/07. President Street crosses the Seaboard Coast Railroad line ahead of the loop ramp for Truman Parkway south. President Street Extension / Islands Expressway continues east 2.5 miles to cross the Wilmington River and 4.5 miles to U.S. 80 on White Marsh Island. Photo taken 05/29/07. Continuing east, President Street crosses Kayton Canal ahead of Savannah Golf Club and the Pine Gardens community. Photo taken 05/29/07. Pennsylvania Avenue provides one of three streets connecting President Street with the Pine Gardens street grid. Photo taken 05/29/07. Woodcock Street stems north from President Street to an industrial area along the Savannah River and Fort Jackson Road to the Old Fort Jackson historic site. Photo taken 05/29/07. Beyond the at-grade railroad crossing at Kerr-McGee Road, Islands Expressway takes over for President Street as the name of the four-lane divided highway east to Whitemarsh Island. Photo taken 05/29/07. Motorists taking Islands Expressway east from Elba Island Road to U.S. 80 will reach Tybee Island in 12 miles. Photo taken 05/29/07. Islands Expressway crosses the Intracoastal Waterway along a pair of single leaf bascule bridges. Photo taken 05/29/07. Dating from 1963, the Sam Varnedoe Bridge is functionally obsolete, requiring constant maintenance. Starting in August 2017, the Island&apos;s Expressway Bridge Replacement Project replaces the 22 foot high movable bridges with a fixed span providing 65 feet of navigational clearance to vessels along the Wilmington River. Photos taken 05/29/07. The original Islands Expressway toll plaza was located just east of the Wilmington River on Oatland Island. Tolls were lifted from the roadway in 1980. Photo taken 05/29/07. Angling southeast across Oatland Island, Islands Expressway crosses Richardson Creek. Photo taken 05/29/07. Islands Expressway east reaches Whitemarsh Island, an unincorporated community surrounded by marshland and the waters of Wilmington River and Turner Creek. Photo taken 05/29/07. Islands Expressway merges with U.S. 80 east at a wye interchange across from Island Towne Center retail plaza. Photo taken 05/29/07. A right turn lane provides access to U.S. 80 west to Johnny Mercer Boulevard and back across the Intracoastal Waterway to Thunderbolt. Photo taken 05/29/07. Funding for the two lane flyover taking motorists from Islands Expressway east onto U.S. 80 & Georgia 26 out toward Tybee Island was included in a package of road improvements approved by Chatham County voters in 1989.5 Photo taken 05/29/07. Island Parkway branches north from U.S. 80 on Whitemarsh Island and crosses Richardson Creek. Photo taken 05/29/07. Island Parkway travels across Oatland Island. A frontage road lines the north side of the four-lane highway, serving adjacent residential areas. Photo taken 05/29/07. The Sam Varnedoe Bridge spans the Wilmington River / Intracoastal Waterway west from Oatland Island to Causton Bluff. Photo taken 05/29/07. The current Sam Varnedoe Bridge consists of a pair of single leaf bascule bridges constructed in 1963.2 The westbound bridge is around 834 feet in length. The eastbound bridge, formerly located at Thunderbolt for U.S. 80, is around 800 feet in length. Photo taken 05/29/07. What is the last drawbridge in Chatham County, the Island Expressway span over the Wilmington River will be replaced with a fixed high level span providing 65 feet of vertical clearance for vessels.3 Photo taken 05/29/07. Islands Expressway transitions to President Street at this railroad crossing and the intersection with Kerr-McGee Road north. Photo taken 05/29/07. Passing between industrial plants and Savannah Golf Club, President Street approaches the north end of Truman Parkway. Built by Chatham County, the $182 million roadway wraps around the east and south sides of Savannah from President Street to Georgia 204 (Abercorn Street Extension). The link south from President Street to Henry Street was completed in June 1997.6 Photo taken 05/29/07. A half cloverleaf interchange joins President Street with Truman Parkway less than a mile ahead of the Savannah historic district. Photo taken 05/29/07. Drivers headed south on Truman Parkway to Thunderbolt, Isle of Hope and Southside Savannah loop away from President Street west to join the county-maintained freeway. Photo taken 09/22/14. Advancing west from Truman Parkway, President Street split with General McIntosh Boulevard, which provided the main route west to Downtown Savannah. Starting in January 2015, the President Street Project rebuilds both President Street and General McIntosh Boulevard, raising both roadways between 5 and 8 feet to offset regular flooding issues. Additionally the new roadway for McIntosh Boulevard, planned for a future phase, accommodates development of the site to the northeast. Photo taken 05/29/05. Drivers continuing west along President Street navigated through a signalized intersection as General McIntosh Boulevard angled northwest to Bay Street. The President Street Project reconfigured this intersection as well. Photo taken 05/29/05. Bay Street maintains four overall lanes as it extends west from General McIntosh Boulevard through Downtown Savannah. Pictured here is the intersection with Lincoln Street. Photo taken 05/29/05. Bay Street westbound at the intersection with Abercorn Street. Abercorn Street is a well known arterial throughout midtown and Southside Savannah, however through Downtown it is a local street bisected by four of the 21 squares. Photo taken 05/29/05. One block further west at Drayton Street north above Factor&apos;s Walk on River Street. Photo taken 05/29/05. Westbound Bay Street at the north end of Bull Street. Bull Street heads south through five of the Historic Downtown squares to Forsyth Park. Photo taken 05/29/05. Whitaker Street ties into Bay Street at the succeeding traffic light along westbound. Access to River Street is provided for pedestrians to the north. Photo taken 05/29/05. Bay Street west next intersects Montgomery Street south to Franklin Street. Montgomery Street is the historic alignment of U.S. 17 north & 80 west. Photo taken 05/29/05. U.S. 17 south & 80 east used to follow Martin Luther King, Jr. Boulevard (West Broad Street) one block west of Montgomery Street, along a one-way couplet. The four-lane urban arterial runs south to Oglethorpe Avenue as a part of Georgia 25 Connector, which links the Talmadge Bridge (U.S. 17) with I-516 & Georgia 25 at Garden City. Photo taken 05/29/05. "Drawing Interest - What do Drawbridge Operators Do All Day?" Savannah Morning News (GA), July 31, 1999. "Chatham County purchases land to replace Sam Varnedoe Bridge." WTOC11 (Savannah, GA) June 25, 2015. "Construction Traffic Staging Modification for Project CSBRG - 0007 - 00(128)." Georgia Department of Transportation, public announcement. "Flyover Muddle." Savannah Morning News (GA), July 13, 1999. "Truman Parkway Finished - Almost. Freeway Project Conceived Nearly 90 Years Ago Expected to Open in March." Savannah Morning News (GA), March 1, 2014.